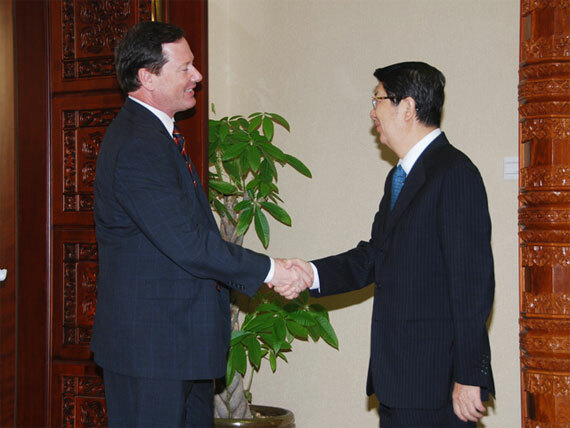 PHNOM PENH, March 22, 2011 (PRU) – Cambodia's Deputy Prime Minister Dr. Sok An has welcomed U.S oil giant oil Chevron to establish its office in Cambodia. This is expected to take place in May this year. His Excellency Dr. Sok An, who is also the Chairman of Cambodian National Petroleum Authority (CNPA), was informed by Chevron officials that the company has planned to establish its office on May 1 and has reaffirmed its commitment to make further progresses with CNPA. The meeting took place on Tuesday, 22 March 2011.
permanent office. 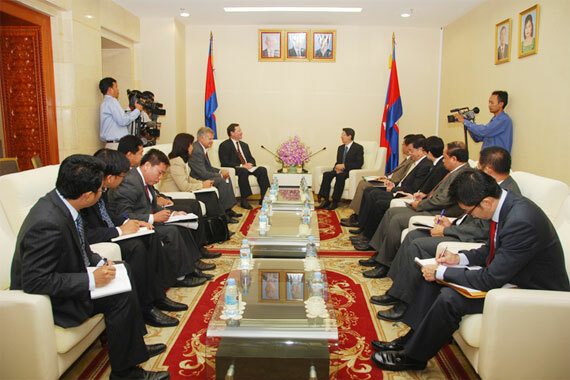 We can now achieve a new phase by establishing an office in Cambodia,” Dr. Sok An said in the meeting. Steve Glick has been appointed as President for Chevron Overseas Petroleum (Cambodia) Ltd in Cambodia. Dr. Sok An, who is also Minister in Charge of the Council of Ministers, said that having the company’s permanent office in Phnom Penh will be vital to increase the level of cooperation between the company and CNPA on how to prepare and train human resources to work for the company’s project. “It is very good timing. And you know very well that we need skilled people to work on Chevron’s off-shore project,” His Excellency Dr. Sok An told the delegation. Dr. Sok An also said that Cambodia’s ministry of education has been working with the Ministry of Labour and the concerned National Vocational Training Centre for preparations to train the locals on how to work on Chevron’s central production platform and processing facilities. Chevron’s officials will be visiting the vocational training centre, located on the outskirts of Phnom Penh on Wednesday (March 23). The company officials said it is a great opportunity and is ready to work with CNPA to get the first oil project running for contribution to the Cambodian economy. In a meeting with Frank Sampson Jannuzi, Policy Director for East Asian and Pacific Affairs for the majority staff of the Senate Foreign Relations Committee of the United States, Dr. Sok An said that Cambodia expects to produce its first oil in December 2012 from “Block A” where Chevron is drilling. Dr. Sok An has said that Cambodia will spend the oil revenue wisely in social sectors for the benefit of the nation and its people. Hi there excellent website! Does running a blog such as this require a great deal of work? I've absolutely no knowledge of computer programming but I had been hoping to start my own blog soon. Anyways, should you have any ideas or techniques for new blog owners please share. I understand this is off subject however I just had to ask. Cheers! it ;) I will revisit yet again since I saved as a favorite it. Excellent post. I was checking constantly this blog and I'm impressed! Extremely helpful info specially the last part :) I care for such information a lot. I was looking for this particular information for a very long time. Thank you and best of luck. [url=http://stmline.net/forum/index.php?topic=461995.msg509667]Chanel Watch White tB1gM2 [/url] attached ArticlesThe advantages of operating business online - gather my success to get. Truly no matter if someone doesn't know after that its up to other people that they will help, so here it takes place.